I spent all of yesterday and all of today in Ganz Hall, the very beautiful recital hall in Roosevelt University named for the long time Director of the Music College which is now the Chicago College of the Performing Arts. This is Rudolf Ganz. Follow the link for a bio of this remarkable man who contributed so much to Chicago's musical life. 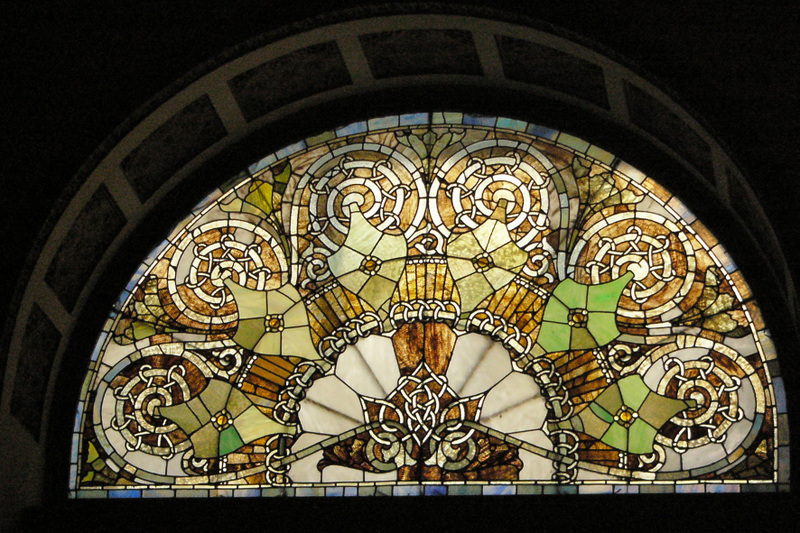 The stained glass window pictured above is just one of a series which adorns this lovely room. It is as good a place as any to do this work! We had two good days, in contrast to the same event last year which was depressing. Maybe we have got better at sorting out the candidates in advance, or maybe those who felt the sting of my tongue last year have been frightened off! Anyway we had two productive days with some nice discoveries and no really weak links. But once gain one is reminded of the fiercely competitive nature of the business of becoming an opera singer. There are many excellent singers who wont make it to the top. But there will always be some valuable work for good ones if they can bear to accept that the Met or the Scala may not be in their future. Yesterday evening I spent an enjoyable evening in the company and as the guest of members of the Wagner Society at one of their regular dinners. They most generously gave me the opportunity to give a hearty plug for COT. And I was delighted that so many of them are already fans of what we do. The first events of the Opera America Board weekend begin tomorrow. We kick of with a meeting of the National Council. More of this later. Following my comments on Tuesday about Berlin's Idomeneo this piece in the WSJ today looks about right! He is really alive and well and kicking with Iphigenie en Tauride at Lyric this week - I was at the Drress Rehearsal this afternoon. The Chicago opera audience is in for a treat. 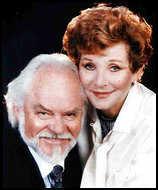 And its not just the Susan Graham show, wonderful though she is in the title role. There are two hugely impressive and refreshing performances from Paul Groves as Pylade - already something of a star of course, and a debutant - Lucas Meachem who is quite wonderful as Oreste. And the best young French conductor of his generation, Louis Langree, is stunning in the pit. And oh yes, Robert Carsen and Tobias Hoheisel, respectively director and designer repeat their Gluck trick from last year when they triumphed with Orfeo - the best thing of that season. Meanwhile in Berlin there is much jumping up and down over the cancellation of some performances of Idomeneo at the Deutsche Oper. That's the one in the former western sector (Richard Wagner Str. in Charlottenburg) not Barenboim's Staatsoper in the East. Well maybe the production shouldn't have seen the light of day in 2003 anyway if the description here is anything to go by. Sounds like a complete turkey (not capitalised). Just the kind of thing that gives German opera production a bad name and coins the good name of Eurotrash! And of course now everyone is defending it for completely the wrong reasons - oh dear. I should say that I have not seen the production - but I think I get the idea..........as I am sure you do. The death of Tom Stewart, on the golf course with his wife Evelyn Lear at his side - golf being their shared passion in retirement - is a tremendous loss to his friends and colleagues and above all to Evelyn, his devoted life partner in all things. But he really hadn't retired - artists rarely do. He continued to share his enormous experience after one of the great American opera careers, with what now seems to be generations of younger American singers. I was with Tom and Evelyn on a jury in Florida just 18months ago and Tom was as wise and helpful as ever. 72 hours before we left for Europe in July a water tank in the roof of our top floor apartment burst and we had a flood - the falling in of the ceiling narrowly averted. Yesterday morning we awoke to smoke for which a completely harmless but wrong explanation was given so we went off to the Shedd Aquarium to see the baby Beluga whale (above). Big mistake - a phonecall brought us hurrying home to find the fire department had hacked a hole in our drawing room wall and extinguished the smouldering insulation that had been ignited by our new neighbour's efforts to keep warm. The fireplace in question had not been used for 15 plus years............such are the excitements of Chicago. So a depressing day. The event of the first half of the week will be the Dress rehearsal at Lyric tomorrow of their new production of Iphigenie en Tauride. We have two full days of our Fall Chicago auditions on Wednesday and Thursday, and the Board of Opera America comes to town for the Fall meetings on Friday, Saturday and Sunday. So we are choc-a-bloc super busy this week. I was really out of everything for a couple of days with this ridiculous cold and cough - something that rarely lays me low. Anyway I was back in the office yesterday feeling much better and being productive for once. I had an as always delightful lunch with Alexander Platt whom I had not seen since the end of our season. He was away in the East running his Maverick Concerts series in Woodstock NY, a summer festival of some age having been founded in 1916. It is the oldest continuous summer chamber music festival in the US. Alex is so versatile - I am sure he does a wonderful job there. Something for us to think about for a future year if we around that part of the world. We had dinner last night for a Board member whom we are trying to persuade to take on the chairmanship of our finance committee. This might once have been regarded as either a bed of nails or a poisoned chalice, or both; but we are in good shape now with our bills paid and free of debt. But that doesn't mean that we are flush with cash - there is still much to be done! We seem to be being hit by high winds, tornadoes even, and lots of rain. And its warm and muggy and generally unpleasant. This will pass. This evening we are off to the wonderful Coco pazzo with old friends and colleagues from Glyndebourne days. One of the many pleasures to had from living in wonderful Chicago! 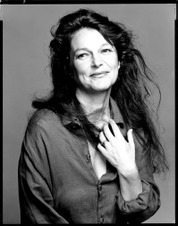 I am happy to find that this week's eloquent and moving piece about Lorraine Hunt Lieberson by that paragon of music critics, Alex Ross of the New Yorker, is available on line. He writes quite beautifully as always - the New Yorker certainly finds great writers. Why would anyone not subscribe to this truly extraordinary magazine? Click this marvelous portrait by Richard Avedon to enlarge. COLDS! But John Keats doesn't mention those! Anyway I have succumbed to some autumn bug so am keeping warm at home this afternoon and probably tomorrow. We shall see. Last night's MOB concert was enthusiastically received and the chorus and orchestra, not to mention the wonderful Glen Ellen Childrens Choir who contributed to See, the Conqu'ring hero comes!, had a deserved standing ovation. It was so good to see an apparently full house at the Harris. This theater/concert hall is now an indispensable part of Chicago life. How did we do without it? We had a very constructive meeting with the Harris this morning sorting out our schedules for the next couple of seasons. Then, despite my spluttering condition, an enjoyable lunch with Michael Tiknis, who runs the show. I had not really seen him since the end of our season. He is excited about the forthcoming New York City Ballet season at the Harris in October. They are doing a great job in selling tickets and fund raising. Can only be good! The Visiting Committee provides an opportunity for the department to address its work to a broader public of interested individuals. The Music Department, which is part of the Humanities Division, looks to its Visiting Committee to foster dialogue and create links with those who are not as familiar with it and the University as they would hope. The Visiting Committee is central to the department's commitment to communication with publics beyond the academy. We are expected to provide advice and counsel at the behest of the Dean or Director. And above all we are advocates and ambassadors for the University of Chicago whenever the opportunity arises within our own spheres of influence such as they may be. The Board of Trustees of the University of Chicago appoints members of Visiting Committees to three-year terms. So I am on until 2009. It is going to be fun and I hope we will be useful. Particularly given that there is a plan to build a new arts center at the U of C including some splendid new performance spaces, I believe that we may have something useful to contribute over the next three years. Anyway yesterday we had a valuable "getting to understand" session led by Jim Crown, Chairman of the University Trustees, and attended by and participated by many of the Deans and Directors - an impressive bunch not surprisingly. They do this kind of thing supremely well. 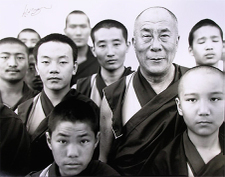 And yesterday evening something completely different - a preview organised by Loyola University Museum of Art (LUMA) of an exhibition The Missing Peace: Artists Consider the Dalai Lama - which opens in October. The photograph here (by Richard Avedon) is part of this exhibition. Yesterday's preview party took place at the Zhou Brothers' amazing Center on Chicago's near South side, hosted by LUMA and our friend Ann Connors. .....to Wrigley Field. It was a miserable evening so we went to a movie instead - a rare treat these days. An amazing performance by Meryl Streep of the legendary Satan of the fashion magazine business - fiction? - well it is based on a novel by one of Anna Wintour's former staffers so who knows?- this was The Devil Wears Prada and was hugely entertaining though scarcely very challenging. The next 72 hours will be much occupied by activities connected with the University of Chicago. I am a new member of the Music Visiting Committee. The U of C has a new President, Robert Zimmer, in succession to Don Randel who has left to become President of the Mellon Foundation. We will be meeting Robert Zimmer at a welcoming dinner this evening. Music has always had a prominent place in the life of the U of C. Don Randel is a musicologist - and that must be a first for the leader of one of the world's top universities. So I feel privileged to be part of this great institution in this small way.